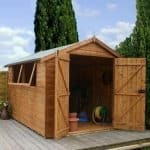 This large timber shed adds great versatility to your garden. 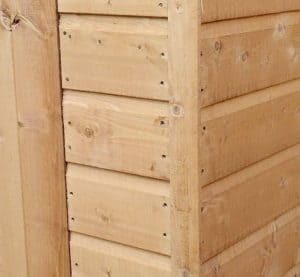 It’s not the tallest we’ve reviewed but its generous depth and width mean that you can store a lot inside it, which is great news if you’re serious about your garden. It can also be used as a base from which to carry out a hobby, such as wood turning, or even as a workshop. With the pent roof carrying water away, you won’t have to worry about keeping yourself and the contents of the shed dry. The tough styrene glazed window allows natural light to flood into the interior, making it a pleasant environment to spend time in. What we liked most about it, alongside its excellent shatter resistance, is that the panel containing it can be positioned on the right, left, or centre, and the same goes for the panel containing the doorway as well. 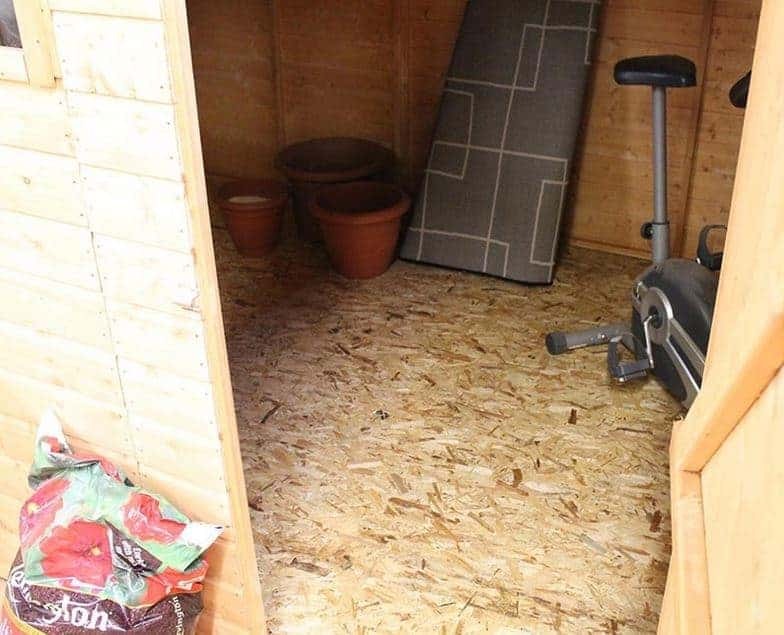 It means that you’ll be able to customise your shed to fit in with your own garden. As well as the pent roof, the tongue and groove cladding also prevents water from getting inside, thanks to its tight interlocking design. These are the reasons why the manufacturer has been able to provide a 10 year warranty against rot. 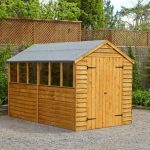 The first thing we noticed about this shed was its size, and for a shed costing less than seven hundred pounds it deliverers a lot of storage space. 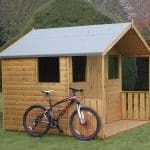 As well as your tools and equipment, you’ll have no trouble keeping bicycles and even children’s play things inside. Its bulk doesn’t detract from its looks, however, thanks to its pleasingly traditional design that should fit in with just about any garden. One element of this traditional styling that we liked is the pent roof. It effectively stops rain and snow from settling without being too grand or obtrusive like we find some apex roofs can be. The ridge height is 2.03m, while the eaves height is 1.70m. Both of these could have been a little taller in our opinion, but the slightly restrictive height is compensated for by the overall width of 3.64m and the overall depth of 2.4m, including the overhang. We were pleased to see that shiplap cladding had been used for the walls, as the interlocking tongue and groove design leaves no weak areas where water can gain access. 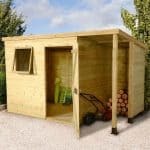 It has a depth of 12mm, which is adequate for a shed of this size, and creates a stable structure when combined with the standard 28 X 28mm frame. It would have been good to see the same tongue and groove cladding also used for the floor, but instead solid sheet material has been used. If you’re planning on using this as a workshop containing heavy items or machinery, we recommend reinforcing the floor beforehand. One feature we really appreciated was the integrated floor joists. They lift the base above ground level, keeping rising moisture at bay. We were glad to see that these joists had been pressure treated, giving them good protection against this threat. 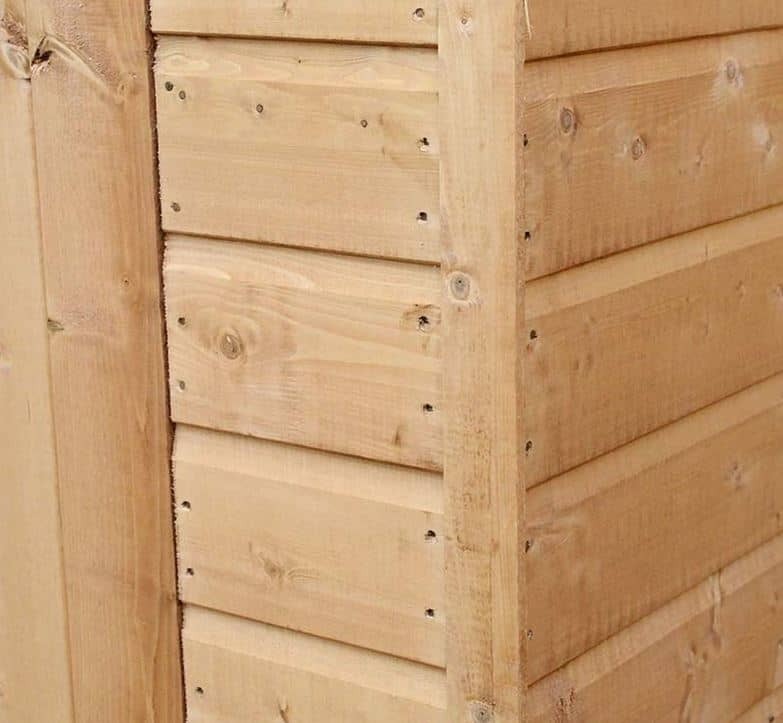 We were glad to find that the timber had been dip treated prior to treatment, a process whereby the timbers are individually inserted into a container full of wood preserver, as this gives it protection against rain and moisture in its all important first few months. It’s important however that extra coatings of wood preserver should be applied on a monthly basis, and indeed it’s a stipulation of the manufacturer’s generous 10 year warranty against rot. A free tub of treatment comes with the shed, which we think is a nice touch as it will certainly help towards the first year’s requirement. The hinged single door is made of the same tongue and groove cladding as the walls, and comes braced and factory fitted. It’s not the largest of doors that we’ve seen, measuring 0.72m wide and 1.66m tall, so it can take some manoeuvring to get wider or taller objects inside. One thing we did like about the door is that its panel is interchangeable, so it can take up any of three positions on the front of this shed. The same applies to the factory fitted window. Made of styrene, it’s much tougher to break than standard glass which is good for both security and health and safety reasons. 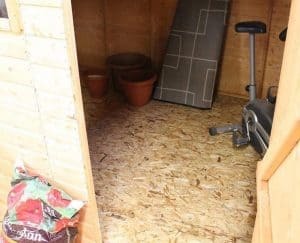 We were pleased that the window is situated quite high up, which makes it harder to see inside for anyone passing by and gives added privacy, and therefore security, to anything stored on the floor of the shed. Security could have been improved still further, however, by the inclusion of a padlock, although the door fastening pad bolt is easy to attach a lock to once it’s been purchased. 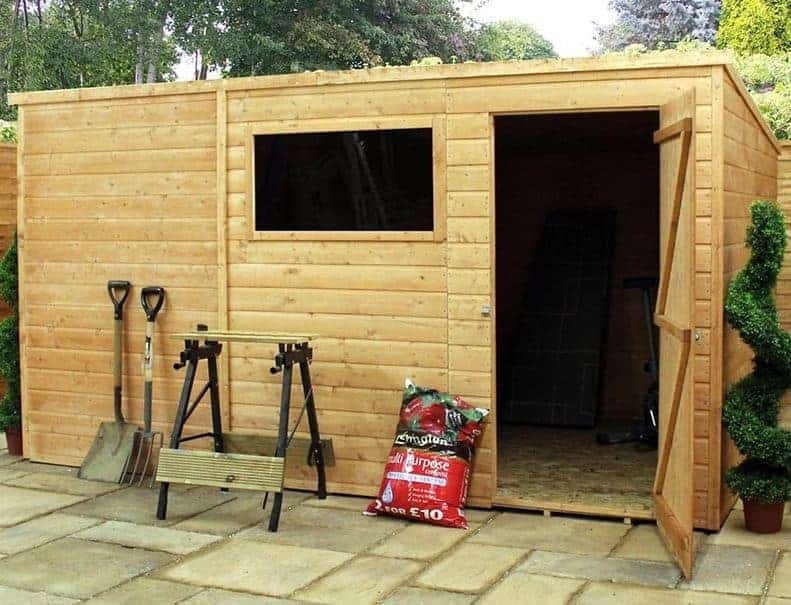 Whilst we didn’t find this shed too difficult to install, we do have a lot of experience in shed assembly and we appreciate that others may have neither the skills or time to do it themselves. That’s why we think customers will particularly welcome two of the optional extras available. The first is a DIY assembly tool kit, so you’ll know that you have everything you need to hand when you begin the task. The other option can be even more useful, as it’s a professional installation service. It costs a not inexpensive £319.99 but it can save you a lot of time and frustration. There has been great attention to detail paid to this shed, as shown by the ease with with the tongue and groove cladding locks together. We were pleased with the 10 year warranty provided by the manufacturer, which gives reassurance, but we would have liked to see a thicker roof and floor. The wealth of floor space makes this a good solution for medium sized gardens, although it’s a pity that more vertical space isn’t available, and that the doorway isn’t a little more accommodating. Due to the modular design, with a friend’s help you should be able to install this in around four to six hours, although the professional installation option is also worth considering. 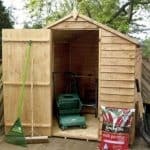 If you save money by installing this shed yourself, with a friend’s help, then this represents very good value for money for a large and well built pent shed. 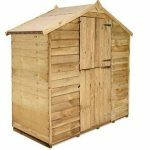 Final Thoughts: We can easily see this good looking pent shed being used as a small scale workshop, although taller people may wish for a bit more headroom. In order to use it for this purpose, a good quality padlock is an essential addition and the floor may need to be strengthened. Even taking these extra costs into account, it’s still relatively inexpensive for its size and versatility. The window is a feature we really appreciated, as it allows the owner to position at whichever end is best for them and thereby provide the optimal light levels to areas where they will be working, or where shelving is installed.